New Orleans Another reason it was good to be in Canada last week, is that I heard everyone’s views on Canadian healthcare, while missing a lot about the new bill being rolled out to almost no applause by Senator Baucus of Montana. The kindest thing people seem willing to say is that the bill doesn’t really pass as comprehensive health care reform at all, nor does it seem to pretend to be. It’s a head scratcher to try and understand why the White House seems to be pushing this sack of stuff down the legislative highway? It seems only yesterday that President Obama was speaking to both Houses of Congress and I swear I heard him say that there needed to be a so-called “public option.” Such an option doesn’t exist in this bill by any stretch of the imagination. And, it goes without saying that immigrants are invisible in this bill as they are supposed to be in our society (though surely not in our economy!). In fact reading some of the more thoughtful reports by health experts, they seem to nail the bill as a huge giveaway to big Pharma and a full and overflowing plate serving to the insurance companies themselves. One fellow noted that the Baucus bill would allow insurance companies to charge 5 times cost to older folks being covered! This isn’t a granny death watch, but an elderly unemployment plan since it would seem to totally encourage workplace discrimination by letting insurers soak employers who happen to have some older and wiser hands on board. Others have belittled the “trigger” to a public option being pandered in an effort to pick up a stray Republican as only ensuring that there will NEVER be a public option. I’m having trouble wrapping my head around this. The right and the Republicans seem intent that they do NOT want a comprehensive health care bill period, so slapping something sorry together doesn’t get any love from them, since they have already announced that they are going to oppose Christmas this year. The progressives and good Democrats wanting to finally move the USA into the rank of modern industrial nations (like Canada, eh?) 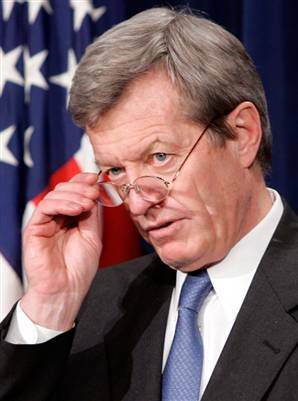 are showing no love for this Baucus concoction. Mike Lux in a well written piece in fact argues that the White House may be allowing civil war within the Demo ranks to break out over this mess. The 47 million folks without health care now in America are not going to be happy with this, nor are any of the rest of us going to be able to paint a smile on ourselves or lipstick on this pig. Tell me then, why are we wasting time with Baucus rather than schooling him on reality and pressing for a real healthcare bill? This entry was posted in Citizen Wealth, Health Care and tagged canada, Health Care, max baucus by wade. Bookmark the permalink.